Advance Tickets to Oakland East Bay Symphony ~ Save 20%! Get tickets to individual concerts now and save 20%! You’re invited to get seats to the 2011-2012 season now – 4 days before tickets go on sale to the general public – and at a 20% discount! Tickets go on sale to the general public on Saturday, October 1. Act now for best seats. We’ve got a great season ahead, including music of the Americas featuring works by Gershwin, Ellington, Bernstein & Ginastera; the monumental Carmina Burana; concertos by Brahms & Dvorak; and an evening with jazz artists Paula West, Daniel Bernard Roumain & Taylor Eigsti. And our Holiday Concert, Let Us Break Bread Together, features a special guest appearance by legendary folk singer Joan Baez this year. Choose the concert(s) you want. Click on the Buy Tickets button and enter the Offer Code OEBSPRESALE in the box provided for your 20% discount. Limit 4 tickets per concert. Discount offer applies to new sales only; discount may not be applied to previously purchased tickets. Inviting 2BR / 2BA Home in the Laurel District ~ Now Priced at $299,000! Leave your hammer behind! Just seven years young, this inviting home has a high 89 walk score so you can enjoy Laurel amenities and commuter access. An oversized master bedroom features vaulted ceilings, privacy and great light. Wonderful flow from kitchen/dining into landscaped back yard. Quiet. Caldecott Properties #18 on SF Business Times’ Top Residential Real Estate Companies in the East Bay! When Caldecott Properties first opened in 2005, one of the goals was to be one of the most successful residential brokerages in the East Bay. For the 2nd year in a row, we have cracked San Francisco Business Times’ list for Largest Residential Real Estate Firms in the East Bay, even jumping up a few spots to #18! Thank you to all our of our loyal clients and friends for helping make us a success ~ here’s to climbing even higher in 2012! Orinda, CA (Sep 2nd, 2011) – The very first Orinda Jazz Festival will reverberate at the elegant Orinda Theatre in Orinda, CA on Sunday, September 18th, 2011 from 6:30 PM – 9:00 PM. This one-day event is also a benefit for victims of Hurricane Irene as well as a fundraiser for local arts, and it features an impressive array of acclaimed international, regional, and local musicians and artists. Scheduled to appear will be two-time Grammy Award recipient, Mads Tolling, an internationally renowned violinist and soloist for Grammy Award winning Turtle Island Quartet; flutists Vivana Guzman, described by the New York Times as an imaginative artist, and Moraga resident Carol Alban; keyboardist Frank Martin, who has performed with Andrea Bocelli and Al Jarreau; guitarist George Cole, a winner of the California Music Award for Best New Major Label Artist; and vocalists Holly Penfield, a San Francisco and Orinda native who has wowed and performed for Prince Charles and Princess Diana in London, Carnegie Hall performer Alvenson Moore, and Mary Jenson, a famous singer with a mellifluous voice. In addition, the festival will feature a host of other celebrated local performers and musicians, including the winners of Orinda Idol contest, which will be held on Sept 11th, 2011. The majority of the proceeds from this for-all-age event will be donated to the Hurricane Irene disaster relief program with a small portion going to the Orinda Arts Council, an established organization that supports visual and performing arts in the community, and to Orinda Theatre’s upgrade of its sound and digital system. Ticket admissions, which include light refreshments, are $20 for the general public, and $15 for students. Tickets are expected to sell out fast, and they are available for purchase at the Orinda Theatre’s Box Office, or at the theatre’s website (www.TheOrindaTheatre.com). 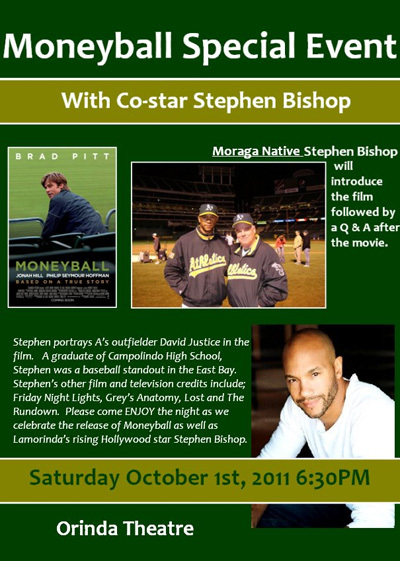 For more details, e-mail info@LamorindaTheatres.com or call 925.254.9065.